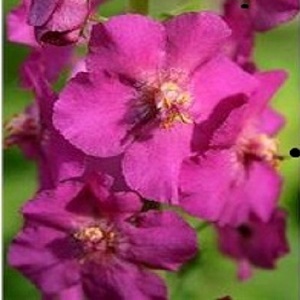 A newer variety of Verbascum with deep pink flower spikes in summer, from May to August. Plants form a rosette of leaves and flowers up to about 60cm in height. This is a great border plant, producing flowers all the way through the summer. Verbascum ‘Rosetta’ prefers full sun and poor, well drained neutral to alkaline soils. Plants self-seed in the right conditions. Sow Sow the seeds on the surface of a tray of moist seed compost, and press the seeds gently into the compost. Keep at around 20°C and germination takes 2-4 weeks. Transfer seedlings to pots when big enough to handle. Harden off seedlings before planting out. Plants from winter/early spring sowings normally flower in the first year. Grow Flower stalks may need staking in more exposed gardens. Cut back spent flower stalks to the rosette of leaves. Plants are evergreen and keep their leaves over winter. Watch out for powdery mildew. Verbascums can be propagated from root cuttings in autumn/winter when the plant is dormant. Plants will self-seed but not necessarily in the same colour.